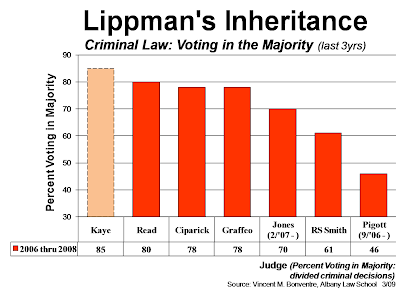 Now-retired Chief Judge Judith Kaye was part of the Court's majority in the non-unanimous criminal decisions more often than any of her colleagues in recent years. A review of all the criminal law cases (41) over the past 3 years in which at least one Judge dissented (or separately concurred on the basis of a substantial disagreement with the majority) reveals that Kaye voted in the majority most frequently, and Judge Eugene Pigott the least. And the margin was significant. Almost 2 to 1. Between Kaye and Pigott, the remaining 5 Judges voted at different--if not so drastically different--rates in the majority. Here's a look at the full spectrum in order of frequency. 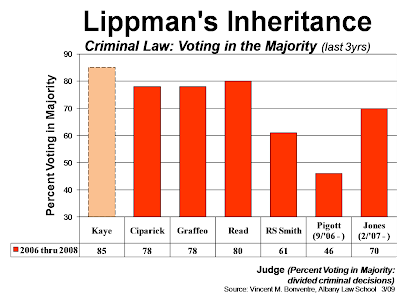 As GRAPH 2 illustrates, 4 Judges--Kaye, Susan Read, Carmen Ciparick, and Victoria Graffeo--voted in the majority at similarly high rates. At the other side of the spectrum, Pigott and Judge Robert Smith were part of the Court's majority the least often. Judge Theodore Jones' rate of majority voting falls between the two groups. The Judges' rates of frequency in the majority take on added significance when considered in light of the the Court's ideological spectrum. Indeed, it all becomes particularly curious. Let's combine the data on majority voting and the ideological pairings in a single graph. Here it is. What the GRAPH 3 vividly shows is that the centrist pairing of Smith and Pigott has the lowest rates of voting with the majority. Now that is fascinating. By contrast, Smith and Pigott--though like Kennedy and O'Connor in having voting records that place them with neither wing of their court's ideological spectrum--unlike the Supreme Court's centrists, do not have the highest rates of majority voting. Instead, they have the lowest! Stated otherwise, they are out of the majority more than the rest of their colleagues. So, the Court of Appeals "centrists," Smith and Pigott, are closer ideologicaly to the Court's liberals and conservatives than the liberals and conservatives are to each other. BUT, they do not appear to be the Court's "swing" votes. They do "swing" from liberal to conservative more frequently than their colleagues. That's just another way of saying that their voting records are not as liberal as that of the liberals, or conservative as that of the conservatives. But they are NOT the "swing" votes in the sense that Kennedy and O'Connor have been. They have not been the deciding factors in making majorities. Rather, they have helped make majorities less often than their colleagues. One more thing before concluding. Among the 3 ideological pairings, the conservative pro-prosecution pairing of Read and Graffeo has the highest rates of voting in the majority. The liberal pairing of Jones and Ciparick, collectively, has lower rates. True, just a bit lower. But that only reinforces what we've already noted. 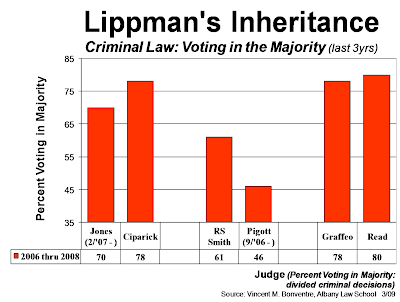 It is not the centrists that have the high rates of being in the majority in criminal cases at the Court of Appeals. Rather, the Judges at the ideological ends of the Court's spectrum do. The conservative pair followed--and closely so--by the liberal pair. The centrist pair is last! Next, we'll take a look at which Judges are voting allies, and which clearly are not.